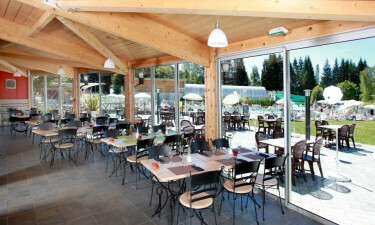 Situated on the picturesque east coast of France in the heart of the lakes region of Jura, Camping Le Fayolan is a first-rate Lux-Camp that has been designed especially for families that have a love for luxury camping. This part of France is famous for its intense natural beauty, complete with lakes, rivers and mountain valleys that are just waiting to be explored, while there are also plenty of activities and facilities to enjoy right on the site itself. Get in touch with Lux-Camp representatives now for more details. Why Should I Camp at Camping Le Fayolan? Special games area for children. Surrounded by intense natural beauty. A pretty, sandy beach set on the edge of a natural lake can be found just a few metres from this luxury camping site and is a great place for the whole family to unwind and have fun together on sunny days, while boat hire is also available here and provides a relaxing way to explore the area. Weekly water games are held in the huge outdoor swimming pool, which features water slides and a shallow area for young children to play in. At the end of a fun-filled day, guests on a camping holiday can unwind in the evening at the fully stocked bar before indulging in freshly prepared French food at the restaurant, and perhaps tearing up the dance floor at the disco. Guests who want to create their own meals to enjoy in their mobile home or on the beach will find fresh local produce at the on-site shop.